Why not package firewall policy with the packages? liam: Because most of the sharing programs that run in the user's session use dynamic ports, so the firewall rules can't be hard-coded. And if you get the programs to open the ports, you'll need to modify a large number of programs, and untrusted programs will be able to open ports anyway. Which wouldn't be any different from not having a firewall for those at all. So am I right in saying that if I turn off Media sharing for a given network, it physically stops the services running then, and then starts them again if I join a different, trusted network? Do the ports in question stay open by default? Therefore if I happen to run some random code that opens a port, it can be contacted from the outside? Media Sharing" wants to listen on your network and allow incoming connections. I can appreciate the problems here but any solution that relies on the firewall being open but there not being any listening services just feels wrong. Perhaps I've misunderstood tho'? Colin: The (user) ports stay open by default. It will start if you requested it to start on a particular network. Instead of nagging the user with questions, we expect him/her to actively request the sharing. 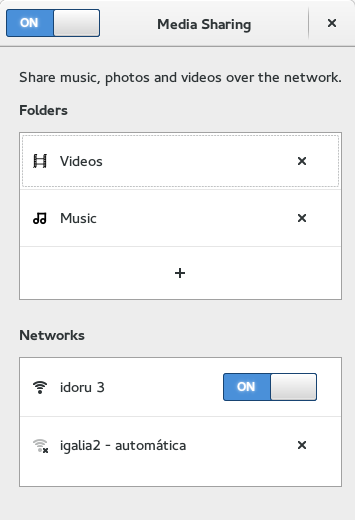 gnome-settings-daemon is responsible for starting and stopping the services, so the services don't start unless you've requested for them to be started. Random code can listen on the network. That's no different from the 2 other options: switching off the firewall, obviously, or allowing applications (that can't yet be identified for certain) to open ports in the system firewall. In the future, that "random code" will be sandboxed, and we'll be able to allow/disallow network access. I'm on F21/gnome. I can enable Screen Sharing with a wired network; works great through an SSH tunnel. But when I'm on the wireless network, Screen Sharing is disabled. The option to turn it on is grayed out. Pstrang: If the wireless network is unencrypted, then it's expected. If you're connected to an encrypted network, it's possible that your NetworkManager is too old. Feel free to file a bug about it against gnome-control-center. Thank you for the quick response. The wireless network is indeed unencrypted. But I turn off vnc-server firewall services and only remote-desktop within an SSH tunnel. Any other way to override this limitation? Pstrang: seeing as you need to modify VNC/Vino's configuration by hand to avoid exporting it on all interfaces, you'll need to start it by hand as well.